Home gardeners looking for a subtle, delicate flower would do well to stay far away from celosias (Celosia spp. ), because they are show-stoppers in the garden. Bold, bright and distinctive, these plants feature unusually shaped clusters of blooms that sit proudly atop tall, slender stems. The flowers can last up to two months, but only if the plants are cared for properly. 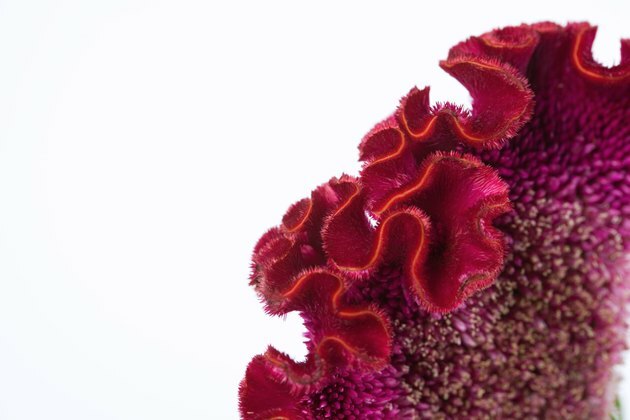 Celosia cristata cultivars feature ridged, fan-shaped flowers. Celosias like warm temperatures. They grow as perennials in U.S. Department of Agriculture plant hardiness zones 10 through 12, and as annuals elsewhere. Even as annuals, their growth can be stunted if they are exposed to prolonged temperatures below 60 degrees Fahrenheit. Hot, humid climates are ideal. The plants grow well in containers, but the indoor air in homes might be too dry for the flowers to thrive. Help them out by running a humidifier next to the pot, or by placing the pot on a shallow tray filled with rocks and a little bit of water. You might be tempted to plant these brilliant beauties where they will light up a shady spot, but celosias need full sun to grow properly. For these plants, the more sun, the better. Indoor plants benefit from a south-facing window. But don't let the sun dry out the soil. Although celosias can tolerate brief periods of drought, they grow much better when the soil is kept continually moist. In fact, you should water these plants before the soil is allowed to dry out. Don't water too much, however -- the soil needs to be well-drained, or the plant can develop leaf spots or stem and root rot. For this reason, containers housing celosia plants should have holes in the base to allow for good drainage. Outdoor celosia plants benefit from a thick layer of organic mulch, which keeps them warm and also helps the soil retain the moisture that allows them to grow tall. In addition, mulch can help stifle the growth of weeds that might compete with your plants. Another way to support your plants is to literally support them -- many varieties can grow more than 2 feet tall and need bamboo stakes or other support structures to keep them from toppling over in a wind or rain storm. Prune off spent flowers before they set seed with pruning shears. Sterilize the blades by wiping them off with alcohol and allow to dry before using. Spider mites are the only insect pest that usually bothers celosias, according to the National Garden Bureau. They are especially prevalent on indoor plants. Unfortunately, chemical controls are rarely effective and must be constantly reapplied. The simplest way to get rid of spider mites is to simply wash them away with a strong stream of water. This has the added benefit of removing dust from the leaves, which can contribute to the rise of spider mites -- especially on indoor plants.